We do many lodging/wedding ceremonies, receptions and vow renewals in our our Gardener's Chapel, either as part of the Elopement Package Special, a quick "Get it Done" or with all 5 cottage reserved, we can offer discounted lodging. 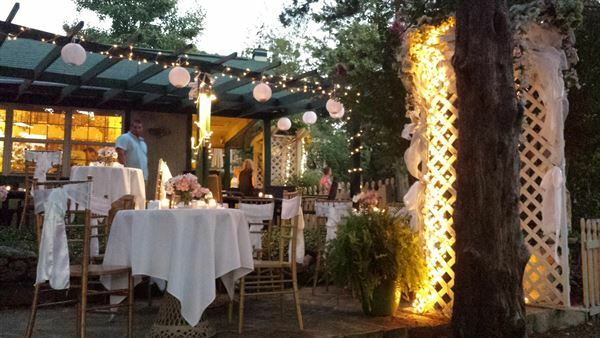 Whether it's a simple and quiet wedding with just the Bride and Groom or and outside garden celebration with up to 16 people, we are happy to include your family & friends for inside our outside events. Events must include lodging packages. The Rock Cottage Gardens is uniquely a one stop shop for your complete wedding, anniversary or relaxation getaway. All private cottage lodging is complete with two person jacuzzi’s, fireplaces for a romantic on site wedding i our own chapel and a custom "make-to-order" wedding or anniversary cake made in our own bakery. We provide a minister, including a Christian or civil ceremony option for weddings or vow renewals. Various wedding packages are available for the bride and groom, anniversaries and other special occasions for single or multiple day stays. Packages provide guests hassle free travel planning by "packaging" only the elements you want for your event. We can help you make appointments and reservations for various activities during your stay.